It’s always a ride through history. What makes gas so expensive in some countries? In Italy, fuel prices are always through the roof, no matter what the state of the world market. In fact, in December, despite falling industrial petrol prices (€0.46 per liter in Italy), filling up cost Italians €1.45 per liter ($5.8 per gallon). There are two reasons for this discrepancy. One is Italy’s 22% value-added tax (VAT). But the real culprit is another, archaic kind of tax called “accisa.” So many accisa taxes have been added to the price of fuel over the years that the total cumulative accisa now accounts for over half the consumer’s price for fuel (Italian). The accisa exists to fund emergency government action, and consists of a tiny, flat addition (not a percentage) to the price of fuel and certain other products. The first accisa was added in 1935, when citizens of the Kingdom of Italy were asked to pay an extra 1.90 lire per liter of fuel (adjusted for inflation, today’s equivalent would be a steep €1.7). The money went to finance then-leader Benito Mussolini’s war in Ethiopia. 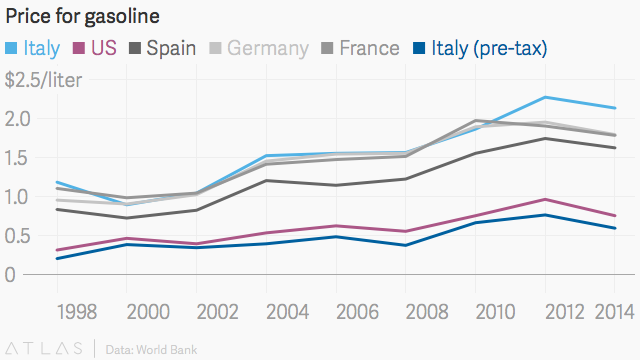 As the tax was never lifted, Italians are still paying for that war today. They’re also still paying for the next accisa, levied in 1956 (Italy was, by then, a democracy): 14 lire per liter to raise funds to face the Suez crisis. As they’re still paying for the accisa imposed seven years later in 1963, when Italy added 10 more lire to finance reconstruction after the devastating Vajont dam collapse in northern Italy. Theoretically, each of these increments should have expired sooner or later, but they’re all still added to the final bill. As they fill their tanks today, Italians may struggle to forget the nation’s years of fascism, railway worker strikes, and many of the worst natural calamities to befall the country over the past century.